American Studies Leipzig is proud to offer a roundtable on The Sweet Smell Of Success on Wednesday, 9 January 2008, 7pm in Villa Tillmanns, Wächterstraße 30. Fulbright Professor Ben Alpers and Picador Professor for Literature John Haskell will screen the 1957 Film Noir Classic. 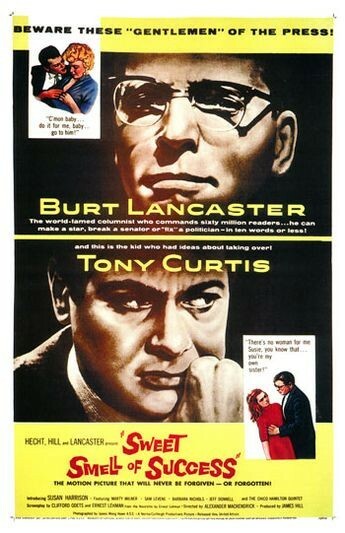 The Sweet Smell Of Success is one of the most deliciously bitter films ever produced by Hollywood. Directed by Alexander Mackendrick, Sweet Smell stars Tony Curtis as down-and-out New York press agent Sidney Falco, whose livelihood depends upon the whims of the all-powerful gossip columnist J. J. Hunsecker (Burt Lancaster). The film features a famous screenplay by Clifford Odets, cinematography by the great James Wong Howe, and a powerful score by Elmer Bernstein. The screening will be followed by an informal discussion with Picador Professor John Haskell and Fulbright Professor Ben Alpers and a small reception. To learn more information, please refer to our flyer below.